Rich creamy goodness on this one my friends. I got a great deal on a flat of strawberries at the farmers market yesterday so am going wild with strawberry recipes. 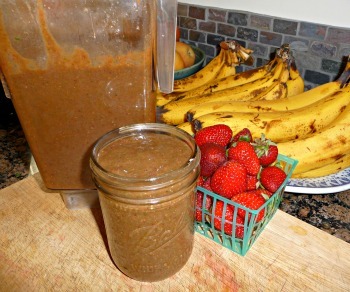 This smoothie was really satisfying and so quick to make. 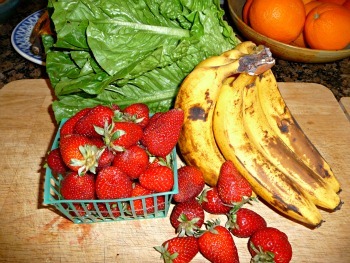 Plenty of fruit to sustain you, a good helping of fresh greens, and some omega 3’s as an added extra. Enjoy! I suppose you could add half a beet if you wanted to keep the color a little more red. How much quanity does this juice provide based on the ingrdients given? Does anyone know how long the fridge life is of these juice too. Hugh's reply*****Great that you're starting in on a healthier way of living. This recipe is for a smoothie and not a juice. It makes almost 1/2 gallon, but can be adjusted to fit your needs. It will keep for about 24 hours in the fridge, although fresh is always best. Most juices will keep in the fridge for a day, but again, are best when consumed right after juicing. When making this quantity, how long will a smoothie keep? I am a single person. Hugh's reply**** I drink the whole thing in the morning, which will last me for 7 hours or so, but you may want to make a half recipe and try that. My last meal of the day is not large so my stomach is quite empty in the morning a ready for large meal. It's always best to consume fresh, but even a smoothie consumed later in the day has far more nutrition than most foods out there.